I am lucky enough this year to be more or less off on the holiday. I work tonight, the 24th, from midnight to 8AM (technically the shift starts on the 23rd at 11:59PM, for clarity in scheduling). So while I am theoretically working christmas eve, I am actually off for the real eve of christmas. I am also off on christmas day. The holidays are different in the ER. There's usually plenty of good cheer and decent food. The staff traditionally flagrantly violates JCAHO standards and brings in a sort of spontaneous potluck which gets set up at the nursing station or in the break room if there is space. There is a sense of camaraderie, in that all of us who are there are kind of pissed off that we have to be at work and not home with our families, but since it is a shared burden we don't get too openly bitter, but sort of refocus on trying to make the best of it and have a marginally festive time where we are. And there is a weird feeling of insularity (especially on the night shift), that we are set apart from the other 99% of the population, being at work when the rest of the real world is on hiatus. More than a little pride in that fact. The holiday clientele is also a bit different from the usual mix. Fair to say that alcohol related presentations increase, though not so much for christmas as New Year's or the Fourth of July. The nursing home patients come in regardless of the day. Old folks overindulge and go into CHF, young men get kidney stones, young women get gall stones, and plenty of people develop acute illnesses. Many (or most) of the trivial or recreational visitors simply don't come in -- it's the one time of the year when everybody has something else they would rather be doing. But there seems to be a corresponding uptick in the psychiatric visits, and the chronic pain exacerbations seem to increase. Last night I saw six migraineurs -- triple or more what I would average. I wonder how much of this is due to the stress of the holiday season and how much is due to the fact that all the doctor's offices are closed. And since all the clinics are closed, the ED volume is about 30% more than on an average day. The acuity is higher than average, and the waiting room becomes an ugly place indeed. Aftercare is a huge problem. There is a five day gap when all the clinics are closed and you cannot get anybody in for an urgent recheck or consultation. But (for once) patients are incredibly resistant to being admitted to the hospital -- as I said, they all have something else they would rather be doing. The worst thing is the relatively rare holiday tragedy -- be it a fatal MI or motor vehicle accident. Knowing that someone's holidays have just been ruined forever casts a pall over the entire ED. Fortunately, in the dozen or so christmases I have worked in the ED, I have seen only a few of those. Maybe I am just lucky. Well, off to work. Happy holidays all. I have migraine headaches and asked my doctor just last month during a visit what should I do if I have another like the one I had just gotten over. I mean I was hurting so bad I just knew I was about to die and welcomed it. I was throwing up with barely any time to come up for air in between. I asked him if I come to his office would he give me something or just what should I do. He TOLD me to to go the ER. He said he did not keep anything strong in his office so it would do me no good to go there. [sigh] This is so emblematic of much that is wrong with health care (especially primary care) in this country. No criticism to you, SIMD, you and many many other patients do what they are told and "just go to the ER." And we are there to see you, because we have to be. But the point is that people like you shouldn't come to the ER. I should be clear on this point -- there are times when, say, a headache or abdominal pain do warrant an ER visit. New onset symptoms which are not well understood do require an emergent evaluation. But for chronic conditions which have been appropriately diagnosed, we are all better off if you are treated by your personal doctor. And let's be honest: doctor's offices do have IVs, medicines, fluids, etc., and if they do not it is a matter of choice on the part of the office practitioner. I am not trying to criticize my office-based colleagues. I suspect many of them would love to provide comprehensive care, from routine and preventative visits to more urgent, acute problem-based care. Flea gets insanely pissed off anytime someone is diverted away from his care. He may be an outlier, but I suspect he is representative of many clinic docs' desires. Most clinic docs will not or cannot manage to provide these services because primary care compensation is so low that their financial viability is dependent on through-put, and the reimbursement given under ambulatory care codes is woefully inadequate compared to disruption to the office flow and the time investment required to provide the care. Change the site, though, to the ER and I can collect three or four times the amount (far more including facility fees) for the exact same service. Even with the recent RVU updates, the system remains broken, and one of the consequence is the shuffling off of much primary care to the ER. Emergency Medicine has been a willing victim of its own success. Emergency Medicine has been all too willing to cover for the deficiencies in the availability of primary care (in terms of numbers and time). Emergency Medicine is not an essential service, but a convenient service. "Just go to the ER" is not a national health policy. I particularly like the last point. This is in addition to any other migraine headache medications which had proved useful in the past (Imitrex, Zomig, etc). As long as the crises which require the above meds are relatively infrequent, I suspect that most clinic docs would not balk at the above, especially when presented in the context of "I want to stay out of the ER." I do not know you, SIMD, and I am not giving you medical advice, because this plan would not be appropriate for everybody. But I suspect that for many people, such advanced planning (or even prescribed acutely) would manage their illnesses better than the ER does. KevinMD linked to an unfortunate guy named Dave who is fighting a tough disease and had a really tough day at the ER. It struck a nerve with me, since I see the same thing every single day of my working life, though not so much from the patient's perspective. I flatter myself that I am better at handling it than the ER doc Dave had to deal with, but I have enough insight to know that I have good days and bad days. Dave was understandably upset about a whole bunch of things: he wasn't seen in a timely manner, his pain was untreated for a long time, the staff seemed to lack compassion, the ER doc listened poorly, the doctor's office was unresponsive and poorly communicative, etc. Pretty frustrating. Part of the frustration was, I think, due to unrealistic expectations of what happens in the ER. Some of the problems may be avoided and/or mitigated in the future with different strategies. Here were my thoughts for Dave and others like him. I have a close family member with IBD, so I have some sympathy for your situation, but as an ER doc, sadly, I have to say that your experience is typical, and future expectations should be tempered by the reality of our "wonderful" health system. 1. ERs are terribly overcrowded. in 1992 there were 6000 ERs nationally seeing 80 million patients. In 2004 there were 4000 ERs seeing 110 million patients. Our ER has not been significantly expanded in over a decade and we see nearly double the volume we used to. So private rooms are a thing of the past, and hallway beds and long wait times are all too common. A three-hour wait is actually on the short end of the spectrum in many ERs, if you have a non-life-threatening complaint. Sadly, a crohn's exacerbation is not dangerous, so you will be at the bottom of the priority list, but requires a lot of resources (bed, IV, labs, X-ray), which will keep you out of the Fast Track. 2. Private MDs rarely ever see "their" patients in the ER. It has become the standard for the ER docs to primarily see every patient and only consult the specialists as needed. 3. "Chronic condition with painful exacerbation" is, sadly, not best treated in the ER. The docs don't know you, may not trust you (due to the high prevalence of drug seekers), and pain perception is so variable that pain of 10/10 is not a priority for the ER staff. It's a grim joke for us that every patient rates their pain as a "ten." Makes it hard to sort the wheat from the chaff. 4. The fact that you were acting as if you were in pain doesn't mean much to us either, since we see so many hysterical people and fakers that all overt demonstrations of pain are taken with a grain of salt. In fact, the general rule in the ER might be that the more vocal a patient is about their pain, the less likely it is than an objective diagnosis will be determined. We are human and have our biases, and tend to respect stoicism. This ironically means that the less you complain, the more sympathetic and responsive the staff tends to be. 5. A better strategy for you is to have a plan with your GI doc of what to do at home when the pain spikes. Have a limited supply of some really strong pain meds which is to be used in case of emergency, and use it only very rarely. And honestly, IV pain medicine is no stronger than oral. So as long as you are not vomiting, oral medicines are preferred. Also, IV pain medicine can be more addictive and seems to decrease the pain threshold for the next episode, and are best avoided for that reason. 6. When home management fails, if it's during working hours, it's better to coordinate with the clinic than brave the ER. Get a same-day appointment if possible, or walk in. Coordinate a direct admission to the hospital, if it's probably going to be necessary. To be sure, some private practices are resistant to this, but the ER (as you learned) is generally not the best place for treatment of non-emergency conditions and should be the option of last resort. 7. Complaining, criticizing, demanding, and threatening the staff (i.e. asking for an administrator) will not endear you to the staff at either the ER or your doctor's office. The staff are human, and their reaction to perceived manipulative behavior will be to get defensive or passive-aggressive. The squeaky wheel does not get the grease. You will get labeled as a drug seeker or fired from the practice or undertreated or treated last. You *are* dependent on the good will of the staff (at both sites), and alienating them is not in your best interests. I do not defend bad behavior on the part of the medical folks, but you have to live in the real world. Sorry you had a crappy day, and sorry the ER doc was a dud. Good luck to you in the future. Scalpel-man tagged me with this meme. I don't usually go for this sort of thing, being fiercely opposed to chain letters and just vaguely curmudgeonly in general. 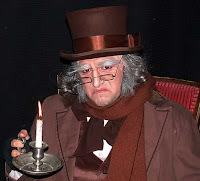 But what the heck, I suppose it'll help prove to The Wife that I am not completely Scrooge-like. It's fun. Oh, Hot Chocolate by a mile. Nog is yucky horrible stuff, cocoa is the staff of life. Even better if it's a Mocha (I am in Seattle, after all). 2. Does Santa wrap presents or just sit them under the tree? It depends on whether Santa forgot to buy enough wrapping paper and runs out at 11PM Christmas eve. Generally, presents get wrapped. However, Santa doesn't learn well from past mistakes and so they are frequently unwrapped. 3. Colored lights on tree/house or white? Tree gets multicolored lights. The house used to get white lights until Number One Son insisted they be blue (no idea why), so we have white lights in the bushes and blue lights along the eaves of the house. 5. When do you put your decorations up? The outdoor lights generally go up the first nice (read: dry) day after thanksgiving. The tree and interior decorations follow shortly after since The Wife gets irritated by the crates lying around. 6. What is your favorite holiday dish? 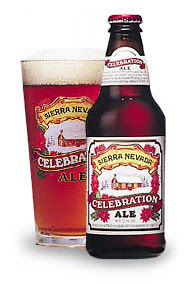 I am not sure it really counts, but I'll say Sierra Nevada's Celebration Ale. I scored a whole case of it this year -- I got to the store just as the distributor was unloading the truck. 7. Favorite Holiday memory? HUGE family parties on Christmas at the houses of various aunts and uncles, with me and my gazillion cousins running around like crazy and making much noise and getting into lots of trouble. 8. When and how did you learn the truth about Santa? I actually can't recall ever believing in Santa. So I must have been pretty young. 9. Do you open a gift on Christmas Eve? Like all right-thinking Americans, no. Christmas Day is the proper and correct time to open gifts. The Wife has expressed another opinion on occasion, but I think she had been huffing paint or something. 10. How do you decorate your Christmas Tree? I drink beer (see No. 6) and wrangle the kids while The Wife obsesses over the selection, set-up, and decoration of the tree. It is a laborious and painstaking process. She will carefully examine every single tree on the lot. The trunk must be exactly plumb once it is in the stand (she uses a laser level for this measurement). This year there are 1500 lights on the tree, each exactly evenly spaced from its neighbor. The outcome, however, is always exceptionally beautiful. 11. Snow! Love it or Dread it? Snow on a flat surface: amusing but a sad waste. Good for the occasional snowman, angel, or fight. Snow on an inclined surface: Nirvana. Haven't in years, but yes. However, a new ice rink and hockey center opened up not far from us recently, and has been a wonderful source of business, from concussions to epidural hematomas. So I'm in favor of skating. Received: Millennium Falcon and Han Solo/Chewbacca action figures. 14. What’s the most important thing? I kind of avoid them. I grew up with Plum Puddings and Trifles and (so sorry, mom) never really liked them. I'm good with Pumpkin Pie and Ice cream. An angel (I had to go look). Let's be honest. I'm a bad bad person, and I acknowledge it, and I have come to terms with it. Receiving. Eh. Truly indifferent. Non-peppermint ones preferred. As befits my status as Resident Curmudgeon, I hereby refuse to throw out any more tags. The meme dies here. The Senate is controlled by a single vote. A democratic senator, Tim Johnson, D-SD, is stricken ill and rushed to the hospital. Reports conflict. He's having a stroke. It's not a stroke. Will he survive? Will he serve out his term? Will a Republican governor appoint a replacement, flipping control of the Senate to the GOP? This is always a maddening part of being a medical professional. Give me 30 seconds with the chart and I can tell you in exact detail what the situation (or at least the differential diagnosis) is. But the vague and contradictory reports, frequently written by media writers not familiar with medicine can be tough to interpret in the best of cases. 1. Senator Johnson had an episode of difficulty speaking, evidenced by stuttering and apparent word-finding difficulty. Audible here via CNN. This does clearly point to an acute central nervous system process such as an ischemic stroke causing expressive aphasia. 2. His condition "appeared to recover" to the extent that he was able to ask if there were any additional questions before ending the call. The neurologic deficit was mild and short-lived. This argues against a persistent structural lesion such as hemorrhagic stroke or tumor. The absence of complaint of headache further argues against such diagnoses. 3. However, after initial improvement, another problem developed: "[He] was able to walk back to his office in the Hart Senate Office Building, then began having problems with his right arm. He thought he was all right, she said, and went to his desk, but came out a few minutes later and it was apparent he needed help." The language symptoms having resolved, he developed new symptoms of a motor nature. The language centers (often called "Broca's area") are typically in the left brain, in the same vascular distribution as the left motor cortex, which controls movement of the right arm. Again, this is consistent with cerebral ischemia, though the intermittent nature of the symptoms and variable type of symptomology suggest transient ischemia (often called TIA or mini-stroke) versus true cerebral infarction, aka stroke. 4. 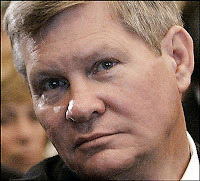 His "spokeswoman Julianne Fisher said the senator did not suffer a stroke or heart attack." That helps a bit. Clearly she is repeating what a medical professional told her. "No stroke" implies a more or less clean CT scan -- if there was a hemorrhage, most folks would call it a stroke or aneurysm, and it's an affirmative enough finding that I do not expect that we would be told "no stroke." Also, "no stroke" might imply that his neurologic exam in the ER was not suggestive of a stroke, meaning no persistent neurologic deficit. And based on what I have heard, heart attack would not generally be high in the differential anyway. 5. But he went to surgery. What surgery? Don't know as of this moment. But if he had a TIA, that would generally involve a Carotid Ultrasound as part of the ER work-up. If that revealed a critical stenosis of the carotid artery, it is possible that he would proceed emergently to the operating room to open the offending artery via a procedure called carotid endarterectomy. Less likely, he could undergo some sort of interventional radiology procedure such as intra-vascular thrombolysis, thrombectomy, or angio-embolization of an aneurysm. These procedures, however, are less common and would generally be performed in the context of a true stroke, and given #4 above, would be less likely, in my estimation. Generally, carotid endarterectomies are not performed emergently, but in the case of a senator, VIP medicine might well motivate a vascular surgeon to do so. I would be surprised, but it is possible that carotid angioplasty/stenting might be possibly performed but it would be much less likely. No further updates are expected tonight. Given the information at hand, I suspect that the Senator had either a TIA or possibly a mild stroke, and underwent carotid endarterectomy. This would imply that his illness might be mild enough to allow him to serve out his term, at the least, and make a full recovery, at the best. It is always possible, and alas, too common, that early media report are inaccurate or incomplete, so I would not hold this estimate out as definitive. Certainly, tomorrow is promised to nobody, and this is a serious condition for the senator, who is, after all, a young man. Regardless of the political implications, our thoughts go out to him and his family, and hopes for a speedy recovery. Sounds like it was an AVM -- Arterio-venous malformation. AVMs can cause bleeding inside the brain which are essentially indistinguishable from a stroke, though as we are seeing with Senator Johnson, the treatment is quite different. It is interesting that he was never described as having a headache, which is typically the hallmark of a ruptured or bleeding AVM. Oh well, that's the risk one takes trying to read between the lines of the incomplete or inaccurate media reports. Presuming that the senator underwent craniotomy to repair the damage, it is a big surgery, and a serious condition, but the outlook for survival and a functional recovery are good. The recuperation period, however, can be prolonged. So it looks as if Congress (for better or worse) has passed the bill which would prevent the 5% cut in Medicare reimbursement to physicians. No action on fixing the SGR formula, but another band-aid. So, fine. Where does this leave Emergency Medicine? Based on the 2006 fee schedule this would yield a weighted average RVU value of 2.45 RVUs per "average patient." Based on the 2007 fee schedule this would yield an "average patient" worth 2.84 RVUs. That's a 16% increase. Since these six CPT codes account for 85-90% of EM revenue, that translates to about a 15% increase in total RVU production. If your contracts are based on the Medicare fee schedule, as all of ours are, that should result in an increase in revenue of that same 15%. One of the tough things about Emergency Medicine, from a business perspective, is that it is not a growth industry. Your business is limited to what walks (rolls) through the front door. You can bill and code as well as you like, but you just can't really *grow* your business, and hence your revenue is pretty fixed. And you're always getting squeezed, by payors, by the government, by malpractice insurers, by the hospitals, and on and on. So to get a "raise," to get "free money," to get at least some tiny token to offset the huge burden we shoulder by seeing all society's castoffs and most vulnerable citizens, well, it's a huge pleasure. And I am going to savor it. Don't say ACEP never does anything for you. Why are we ruled by these miscreants? I apologize for my extended absence -- I think I went on blogging overload after the election, and frankly, have had writer's block the last couple of weeks. Also, I have not been working clinically too much, which limits the "bizarro" stuff I get to see and write about. "House and Senate negotiators just reached a compromise bill that would eliminate a scheduled 5% Medicare rate cut for physicians in 2007 and establish a 1.5% incentive increase for doctors who report on quality measures." Wow! Great news! This scheduled rate cute (the first of an estimated 30% cut in physician reimbursement) has been hanging over our heads and causing great anxiety in the medical community. So I was thrilled to see that it looks like it would be canceled. Among many, many other unrelated line item tax breaks and carve-outs, some reasonable and many heinous. Why are all these unrelated items in one bill? Why is this bill the very last thing Congress is acting on before adjourning? Why, every year, is the freeze on physician reimbursement cuts linked to some unholy compromise. I wish I could say with confidence that things would be different or better under the incoming Democratic Congress. I suspect that the objectionable content of these smorgasbord bills will be lessened. On the other hand, I suspect (wrongly, I hope) that the Democrats may be less friendly to a freeze on the Medicare cuts, which will already have gone into effect. At any rate, it certainly won't be one of their legislative priorities. And over at The Health Care Blog, they complain that "the AMA still has Congress where it wants it." Weird.